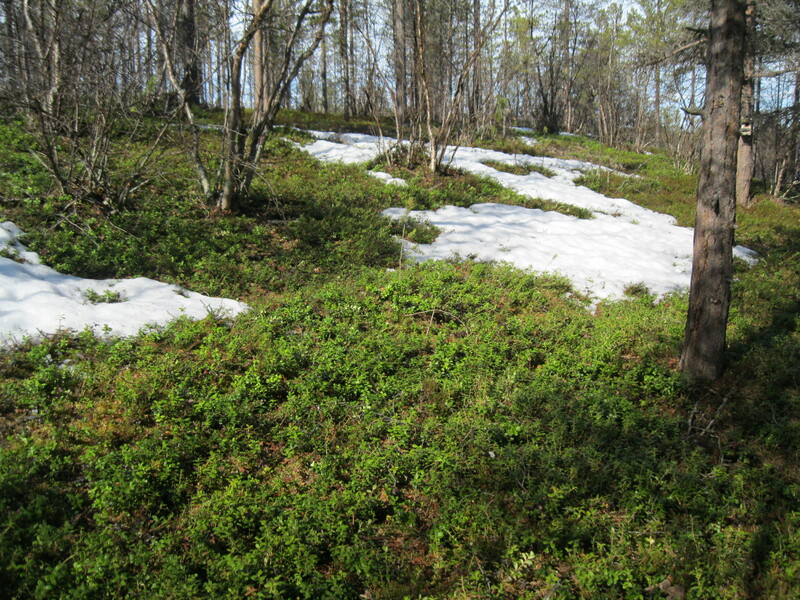 Interestingly, there have been scientific studies that measure the ability of plants to use sunlight that’s filtered through snow layers, and turns out that plants are quite proficient at using even the small amounts of radiation that penetrates the snow. I’ve also heard tell that plants stay green all winter long beneath the snow, and I suppose that makes sense, since it’s not like chlorophyll disappears when cold…. Reasonings aside, the lush greenery amidst the remaining snow piles is cheery, and almost as welcome as the fabulously not-freezing temperatures! I never thought it would be the case, but it appears that I have become one of those people who considers 40F t-shirt weather. In addition, you drape paper streamers and balloons all over yourself. I saw a shocking number of people who had blown-up lab gloves tied to their belts in lieu of real balloons. 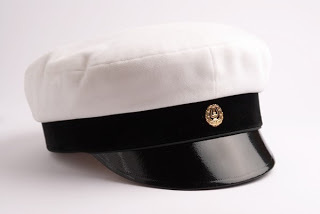 But most importantly (and age-independent) is the ylioppilaslakki, or the graduation cap. 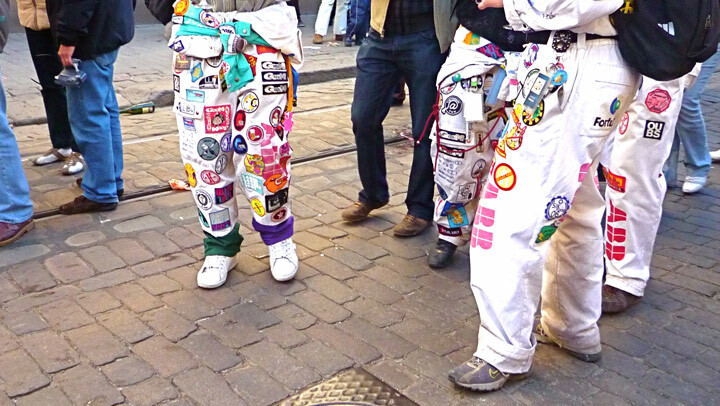 These are what you wear when you graduate from high school here, and they’ve been the same for probably as long as we’ve been wearing those cardboard slab graduation caps we wear in the States. But these are awesome, unlike our version. First off, they’re velvet. Secondly, you look like a sailor! A smart, white-tiger-like sailor. The white velvet yellows with age, and so the color of your cap indicates your age, essentially. And age is a good thing, so wearing your yellowing cap on Vappu indicates that you’ve been a smarty-pants for a long time. So pretty much everyone over the age of 18 is sporting this tremendous headgear on Vappu. I borrowed a friend’s cap, because she doesn’t ever wear hers (she’s clearly crazy), which she stores in plastic, so it was super white and clean and meant that everyone thought I was 18, which for a lady approaching her youth’s dotage, was kinda cool. I went out on Vappu Eve determined to get a patch of my own. 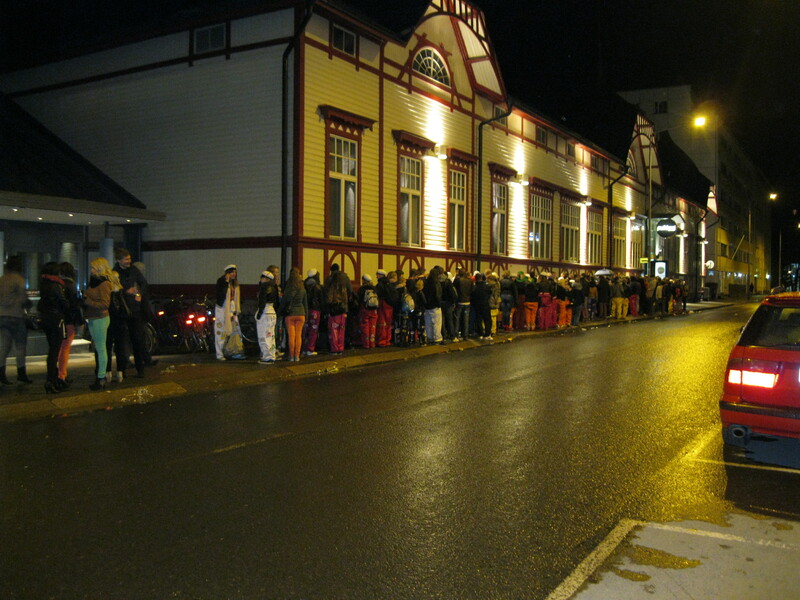 I abandoned my mission when I saw the line to get into the official student party, and heard that there was a cover charge, which is repellant. It was also raining and I wasn’t drunk, so I would have been able to feel the discomfort of hours in a line in the rain, unlike my younger soused compatriots. Vappu also has a few yummy traditions, namely sima and tippaleipä. Sima is a home-brewed mead beverage of sugar, yeast and lemon juice (and optional raisins) that you make about 2 weeks in advance to give it time to carbonate and ferment a bit. The alcohol content in sima is negligible, but it’s a nice, crispy, clean refreshment perfect for toting along on picnics. 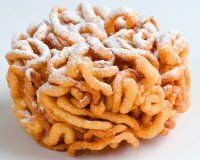 Tippaleipä is a small, super crunchy version of a funnel cake. It translates as ‘drops of bread’, which is about as etymologically accurate as ‘funnel cake’. True to form, the Finnish version is smaller and drier/crunchier than the American one, but wonderful as long as you weren’t expecting the soft, chewy goodness of a ‘normal’ funnel cake. Maybe more personally momentous, I bought a car!! I now officially own more in Finland than in America. This car will serve as my field car for the summer, since I need to travel the 25km between Kevo (where I sleep) and my field site (where I work) nearly daily. Bonus: I feel a little like J.Lo, since I bought an adorable little Fiat. 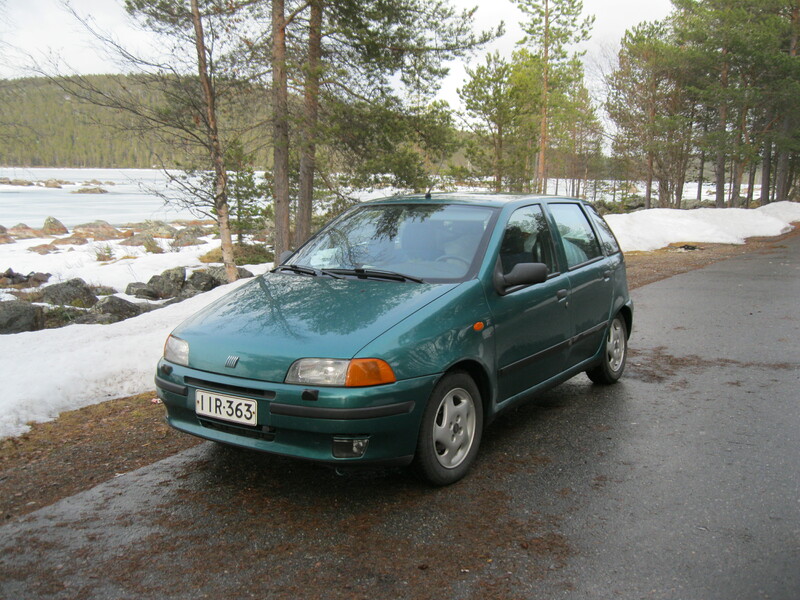 Being a car-owner also meant I got to take a 2-day roadtrip when I moved from Kuopio to Kevo, which was fun. I stopped in Oulu for a night, where there are 2 other Fulbrighters and a good friend from Kevo, all of whom I visited with. 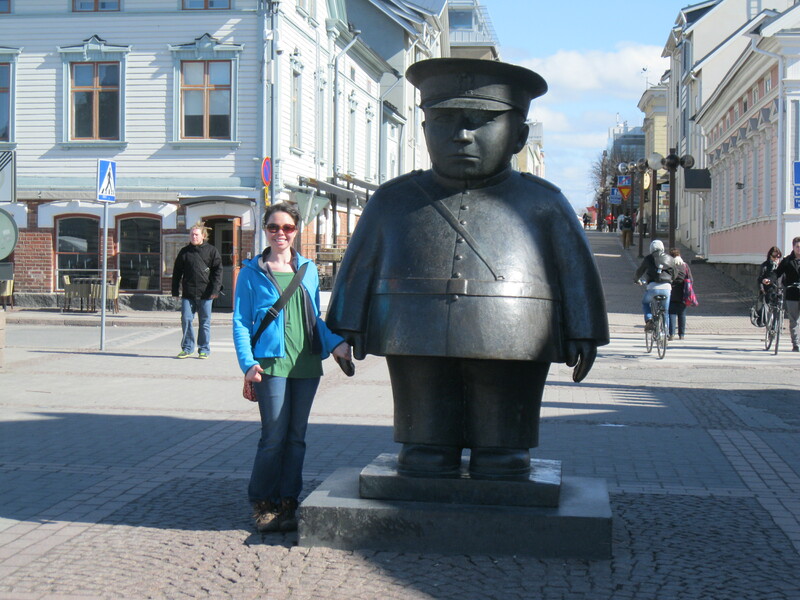 I also met the rotund ‘Toripolliisi’ (Market Police), an Oulu landmark statue that guards the city’s main market square. So now I’m settling in for the summer here in Kevo. 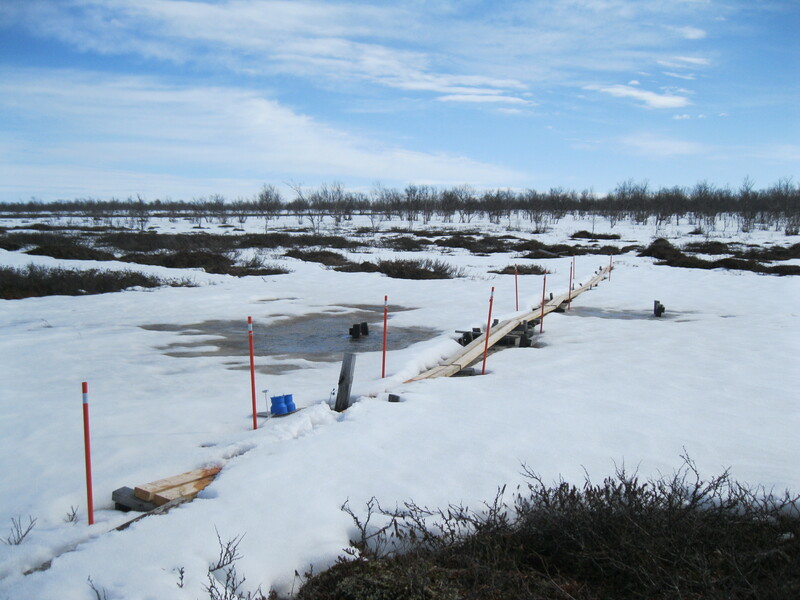 I’m also starting to see the ground again at my field site, which is disorienting after so many months of seeing it as an unadulterated expanse of pure white. The sun is also not really setting anymore in Lapland, so we’re moving closer and closer to the perpetually-sunny summertime. Spring has come. Crazy. 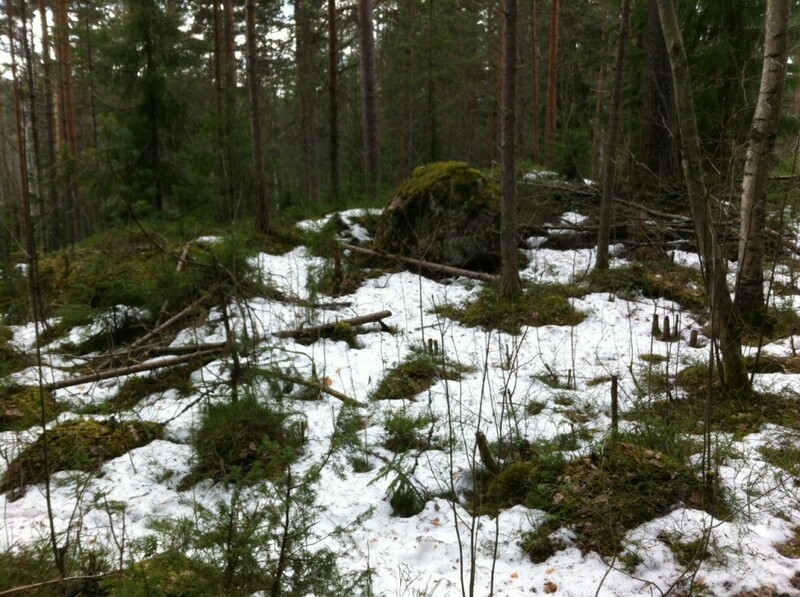 This entry was posted in Kevo, Kuopio, Travels by Kim. Bookmark the permalink. 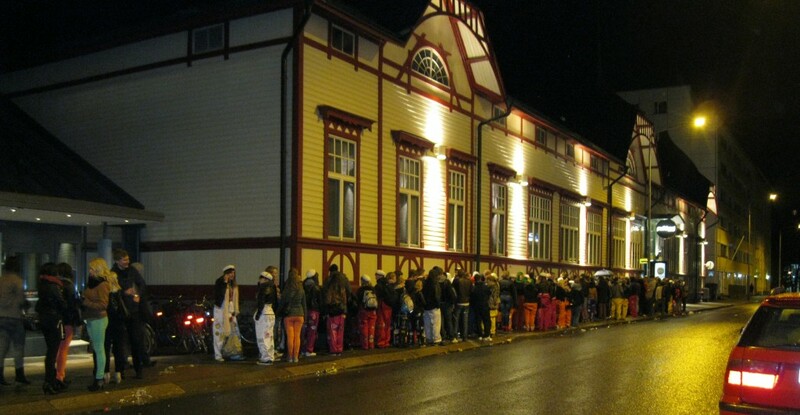 Who knew Finland would be so fun and quirky? Those hats! Wow.